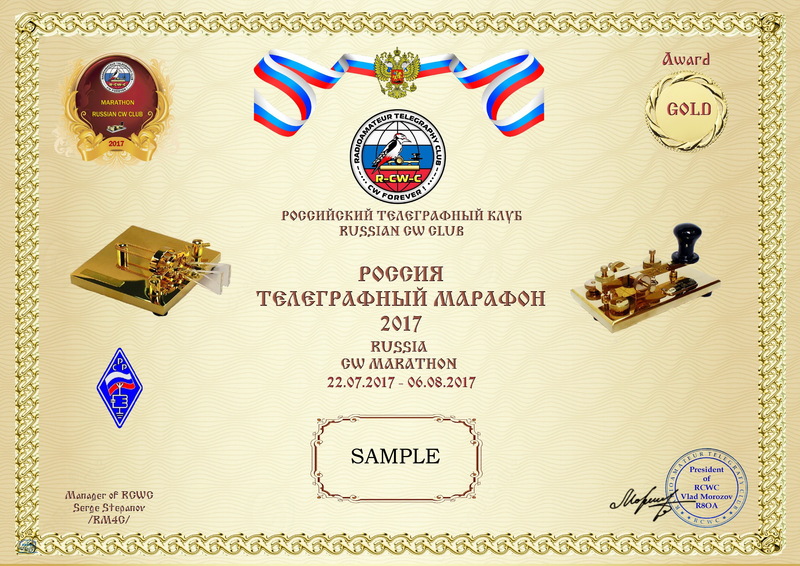 Diploma "Telegraph marathon of R-CW-C 2017"
The diploma is founded by the Russian telegraph club (R-CW-C) with joint participation of clubs DRC (Lazarevskoye), CQCW (Anapa), Sporadic (Kursk) and club "CBG" - "A bear glade" (Liski). The diploma is issued for radio communications with the amateur radio stations using call signs of temporary use, received by them for participation in a marathon. 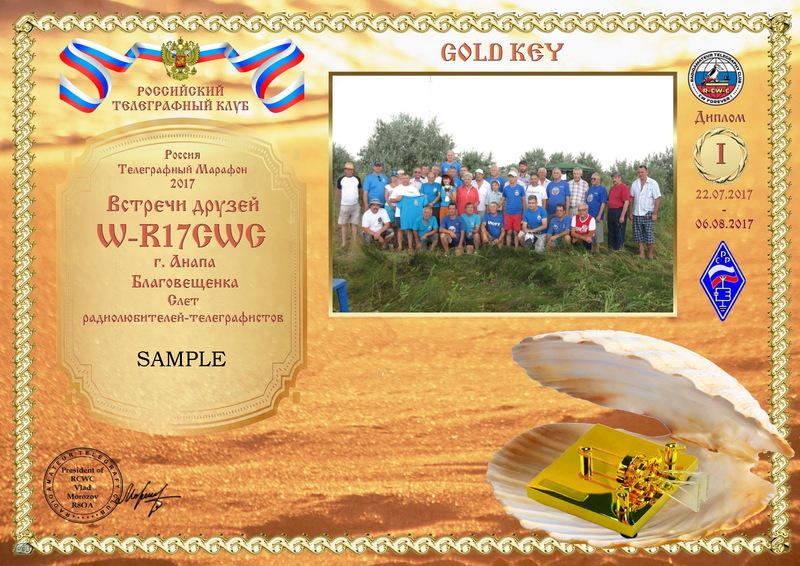 The diploma is founded by the Russian telegraph club (R-CW-C) with joint participation of clubs DRC (Lazarevskoye), CQCW (Anapa), Sporadic (Kursk) and club "CBG" - "A bear glade" (Liski). The diploma is founded in honor of the 5th annual meeting of fans of telegraph which takes place during the period from July 22 to July 31, 2017 near St. Blagoveshchensk Krasnodar Krai. The diploma is issued for communications with the R17CWC radio station working from the venue of a meeting. 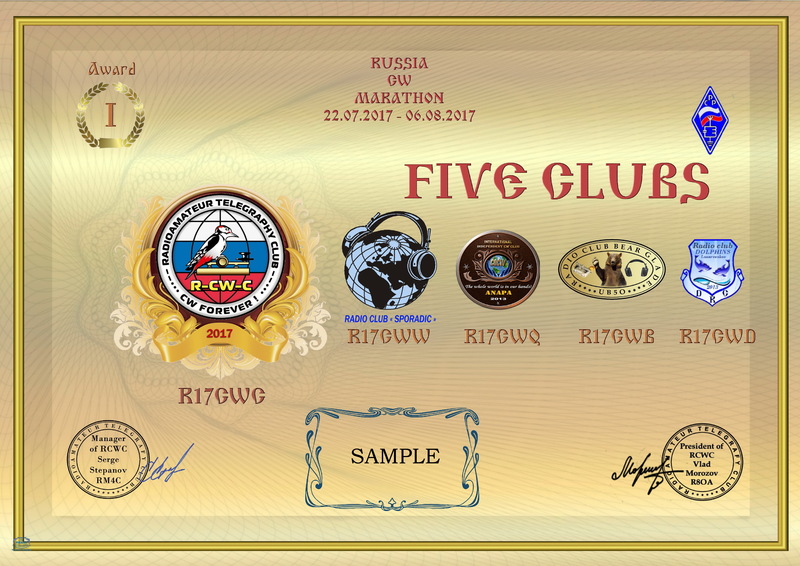 The diploma is founded by the Russian telegraph club (R-CW-C) with joint participation of clubs DRC (Lazarevskoye), CQCW (Anapa), Sporadic (Kursk) and club "CBG" - "A bear glade" (Liski). The diploma is issued for radio communications with the amateur radio stations using call signs of temporary use, received by them for participation in a marathon and representing on air the above-stated radio clubs. The diploma is founded by the Russian telegraph club (R-CW-C) with joint participation of clubs DRC (Lazarevskoye), CQCW (Anapa), Sporadic (Kursk) and club "CBG" - "A bear glade" (Liski). The diploma is issued for radio communications with the amateur radio stations using call signs of temporary use, received by them for participation in a marathon. 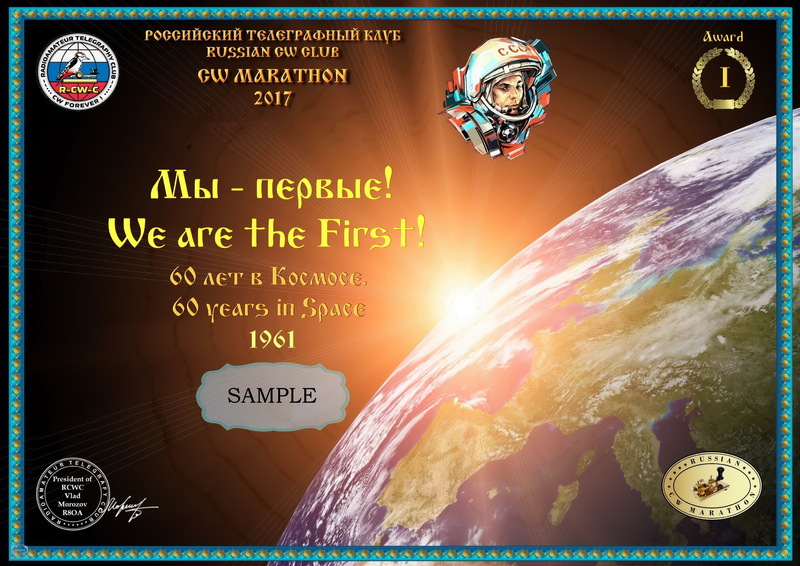 The diploma is devoted to a significant event, noted this year – 60 to the anniversary of flight of the first artificial Earth satellite. Date of start of the satellite is considered on October 4, 1957 the beginning of a space age of mankind. The diploma is founded by the Russian telegraph club (R-CW-C) with joint participation of clubs DRC (Lazarevskoye), CQCW (Anapa), Sporadic (Kursk) and club "CBG" - "A bear glade" (Liski). The diploma is issued for radio communications with the amateur radio stations using call signs of temporary use, received by them for participation in a marathon. 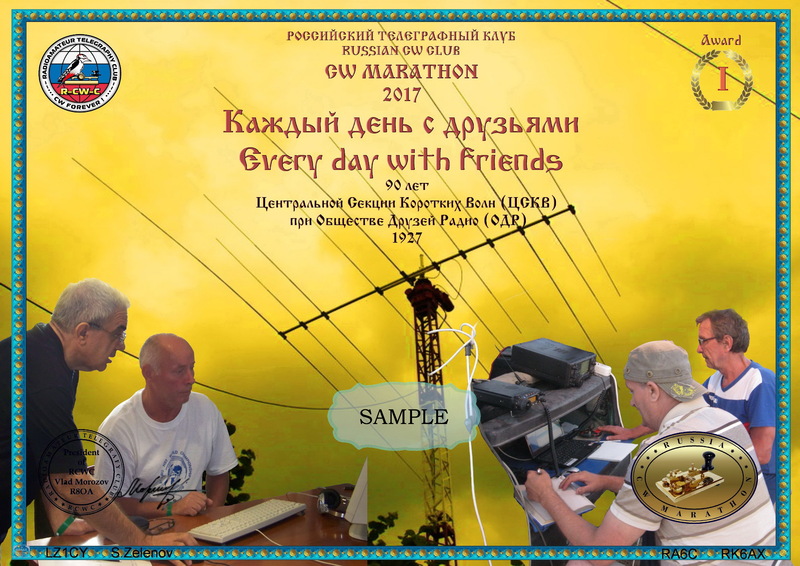 The diploma is devoted to a significant event of the radio amateur movement in Russia noted this year - to the 90th anniversary of the Central section of Short Waves at Society of Friends of Radio. On February 5, 1926 for involvement of enthusiasts to studying and development of short waves, the Council of People's Commissars of the USSR has adopted the resolution "About Radio Stations of Private Use". This resolution, in fact, the short-wave radio amateurism was officially authorized. It granted the right not only to the organizations, but also to certain radio fans to have own send-receive radio stations. In March, 1927 the Central section of short waves at Central office of Society of Friends of Radio has been created. There was a QSL bureau. More than 10 radio fans call signs have received. At the same time also collective stations began to appear the radio station Nizhny Novgorod R1NN became the first of them. 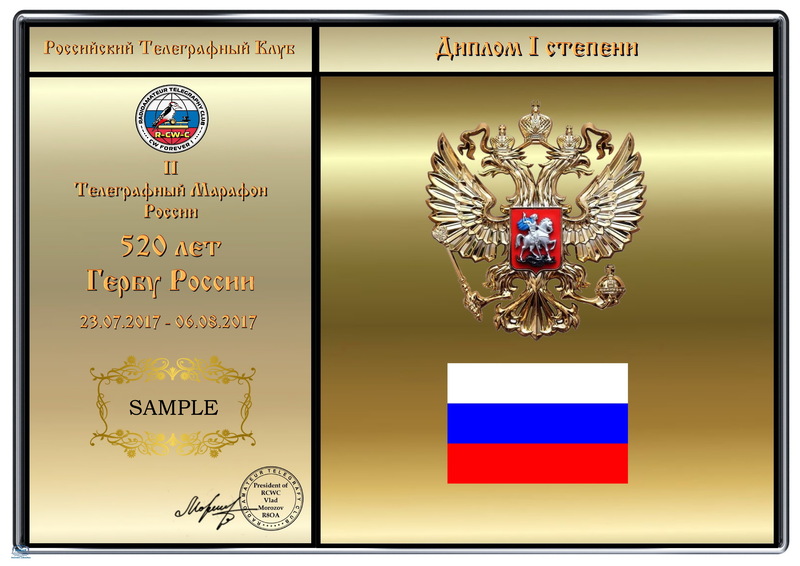 Diploma "520 years to the Russian coat of arms"
The diploma is founded by the Russian telegraph club (R-CW-C) with joint participation of clubs DRC (Lazarevskoye), CQCW (Anapa), Sporadic (Kursk) and club "CBG" - "A bear glade" (Liski). The diploma is issued for radio communications with the amateur radio stations using call signs of temporary use, received by them for participation in a marathon. The diploma is devoted to a significant event, noted this year - 520 to the anniversary of the Russian coat of arms in the form of a two-headed eagle. The first two-headed eagle officially became the coat of arms at Ivan III in 1497.